Just minutes from everything. Disney World, Sea World, Universal Studios and the Orange County Convention Center are just minutes from Vista Vacation Rentals. Plus you'll have three swimming pools and hot tubs, a beautiful 72-par public golf course across the street, a full grocery store within walking distance, and the famous shopping and dining experiences along International Drive. Yes, Vista Cay Resort has everything you need for the perfect Florida vacation. You'll feel right at home in our clean and comfortable Vista Vacation rentals where we provide everything you need for a couple evenings or an extended stay. First floor condo, fully equipped - all the amenities - your perfect Florida vacation! 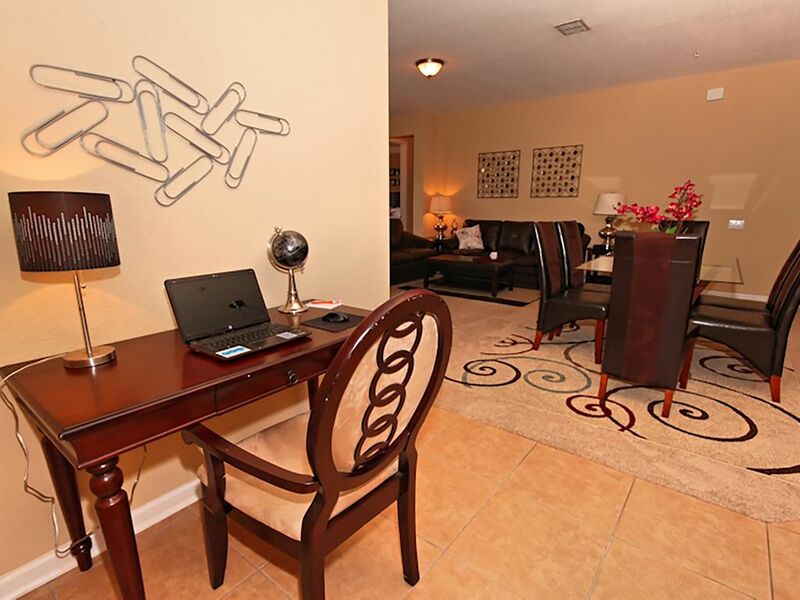 A high end decorated 3 bedroom condo , in the Vista Cay Resort. 50' TV in the living room and TVs in each the bedrooms. There is also a sleeper sofa for 2, the master bedroom suite has a king size bed with en suite bath. The second bedroom also has 2 full size and third bedroom has a king size bed. The unit will include towels, linen, iron with ironing board, coffee maker, hair dryer, microwave oven, refrigerator, electric stove, dishwasher, electric toaster, central heat/air, dishes, cookware and utensils. We are a small family operated company that strives to keep the personal touch felt while providing all the perks that the big businesses have. Our goal is to provide you with the best of both worlds. We have rented different condos from Steve and Denise of Vista Cay Rentals. They have all worked out very well. Clean, spacious, rooms. Helpful responsive property manger. A lot of stairs. There were a couple things that need taken care of but all in all we enjoyed our stay. 1. The headboards were not attached and that was annoying since I read at night and lean against the headboard. 2. The air return grate in the main living area is very dirty - that should be attended to right away. 3. We rented movies and unable to watch them because there was missing cord - we called and they told us they'd take care of it but it wasn't done. Centrally located area, exactly what we needed. Property was spacious and clean. Everything we needed was provided. Management company was responsive We will definitely return! Great location. Clean place that was perfect for our family trip. 3. Large cooking pot (lid present, but no pot. We wanted to make spaghetti but could not because there wasn't a big enough pot). Actually, the kitchen amenities were quite "bare bones". 9. A bottle of wine or cheese & crackers as a nice welcome gift (of course, this is completely unnecessary, but always a lovely touch). We noticed that the master bedroom TV set volume is uncontrollable. It will continue to get louder & louder automatically. We weren't able to watch it at all. Also, the coffee pot is unpredictable. Sometimes it is difficult to get the switch to stay on. All in all, a pleasant stay, but these few issues would probably prompt me to look for another place to stay when we visit again. Especially, since the rental price was high. We definitely would have appreciated a request for the pots/pans, scissors, steak knives, etc. needed while you were here as we would have addressed them for you. This is a 'self-concierge' property, we do provide the starter pack, so that when you arrive, you do not have to go out immediately. No food items are provided for safety reasons. and we would definitely not provide any liquor items since we would not have any control over who would consume it. We also do not provide any 'plastic' items as they could not be 'sanitized' for the next guest. Spacious, neat and clean condo. Tasteful and comfortable decor and furnishings. Second time staying at Vista Cay Resort-love the pool and bar. This floor plan fit our family much better and the convenience of being on the first floor is unmatched. Denise R. was super to work with from booking through to our departure. Looking forward to returning! Vista Cay is located at 4874 Cayview Avenue, Orlando, Florida 32819 where you will be a 15 minute drive from Disney World®, 3 miles from Universal Studios®, and 1 mile from SeaWorld®. You will be within walking distance (1/2 mile) to the Orange County Convention Center. There is also a great variety of dining and entertainment offered on the nearby famous International Drive. All guests must be 22 yrs or older except children traveling with parents Processing fee 4% We accept Visa, Mastercard, American Express and Discover. Rates are subject to change without notice. Tax, processing fee and cleaning fee are additional charges. The purchase of a vacation rental damage protection $50 USD (non- refundable) or a refundable Damage Deposit of $400 USD would be required prior to check in. We will be happy to answer any questions and confirm a reservation for you.